Teixeira Farms of Santa Maria, CA, has been honored as the winner of American Vegetable Grower magazine’s 2006 Grower Achievement Award. The winner was announced as part of the United Fresh Produce Association’s Washington Public Policy Conference September 13, 2006. The Grower Achievement Award honors vegetable growers for excellence in marketing efforts, innovative food quality and safety procedures, industry leadership, and community outreach. 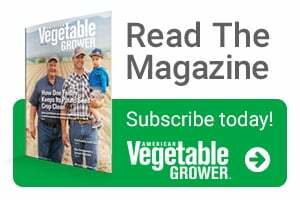 The award is sponsored by Syngenta Seeds/ROGERS® Brand, and is presented by Meister Media Worldwide, publisher of American Vegetable Grower, American/Western Fruit Grower, and Florida Grower magazines, in cooperation with United Fresh Produce Association. Nominations for the 2006 Grower Achievement Award were solicited from growers, researchers, vegetable associations, and allied industry members from across the country. Started by J.C. Teixeira in 1937, the operation began a significant period of growth when two of J.C.’s five sons, Norman and Allan, took over the family business in 1970. They were soon joined by brothers Marvin, Glenn, and Dean. “They had a vision to be the best,” says Allan’s son-in-law, Teixeira Farms’ Harvesting Manager Vincent Ferrante. The Grower Achievement Award is recognition that they have achieved just that. Teixeira Farms has been a leader in embracing new technology. They use GPS mapping in their crop protection material applications, and most recently, they incorporated autosteer technology for listing planting beds. Land leveling is now done with GPS technology as well, cutting a process that used to take five or six days down to one day, and reducing engine emissions and fuel use. As one of the first farms testing for E. coli, Listeria, and Salmonella, food safety has always been a priority at Teixeira Farms. For 18-plus years the company has been active in the food safety arena by hiring Primuslabs.com to develop and execute its food safety programs. Members of the Teixeira family are leaders in both the industry and community. That “family” feeling extends to the more than 1,000 employed at Teixeira during peak growing season. The farm contributes $5,000 annually toward scholarships for employees and their children to promote education and also honors long-time employees for every five years of service. In addition to Teixeira Farms, four other grower operations were named as national finalists for the 2006 Grower Achievement Award: Fred W. Eckel Sons Farms, Clarks Summit, PA; Sterman Masser Inc., Sacramento, PA; TKM/Bengard Farms LLC, Belle Glade, FL; and The Vollmer Farm, Bunn, NC. Nominations Open for the Grower Achievement Award!